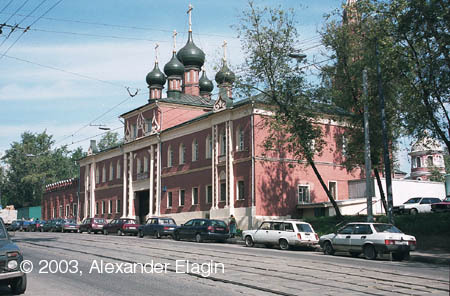 Preobrazhenskaya Square and Preobrazhenskiy Val Street are located in the north-eastern part of Moscow where Preobrazhenskoye village had been many years ago. To tell the truth, the original name of the village had been Sobakino (Doggy Village), and the new name was given after the erection of Preobrazhenskaya (Transfiguration) church in the middle of 17th century. There was one of Czar's palaces in Preobrazhenskoye, and it is this place where Peter the Great spent his young years. Preobrazhenskiy regiment, initially created as an amusement for the young heir of the Russian throne, later became the basis of the modernized Russian regular army. The new life of this former suburb of Moscow was begun in the early 1930s. New industrial zones and factories replaced dumps and orchards; Khapilovskiy pond on Khapilovka river had been drained and filled up, and a new straight and short road had connected Preobrazhenskaya Zastava Square with Semyonovskaya Zastava. And, of course, a new tramway line along the road was put into service in 1932. 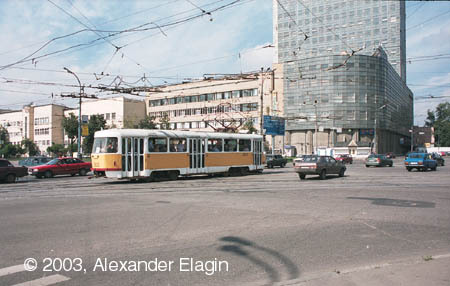 The heavy motorcar traffic along the street, as well as a heavy passenger traffic on the tram line, are even heavier today, and one can hardly spot a tram here not packed with commuters. 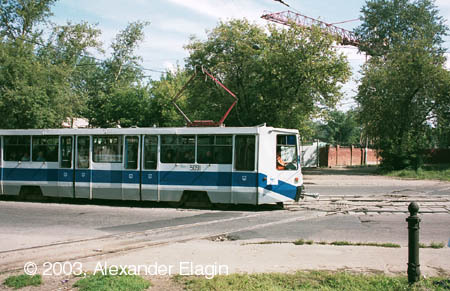 By the way, line 46 that operates here among others is one of the longest existing tram routes of Moscow. It already worked here in 1930s and continues service to date. Preobrazhenskaya Square is not remarkable for its architecture (in fact, a very ugly one) and even for its almost permanent traffic jams - you can hardly find a place in Moscow today without traffic problems. The most interesting (from the tram point of view) is the track intersection in the centre of the square, making up almost the full Grand Union junction with only one branch missing. The building of Preobrazhenskiy Val is various: from standard concrete blocks of 1980s to the old red brick houses of late 19th century. A chapel at the entrance of Preobrazhenskoye cemetery has been recently thoroughly restored. From this place, the road rather steeply declines to the former valley of Khapilovka river, completely entubed many decades ago. Preobrazhenskiy Val ends here, at the level crossing with a railway branch connecting an industrial zone along Yauza river with Cherkizovo railway station. The branch follows the former river bed of Khapilovka. 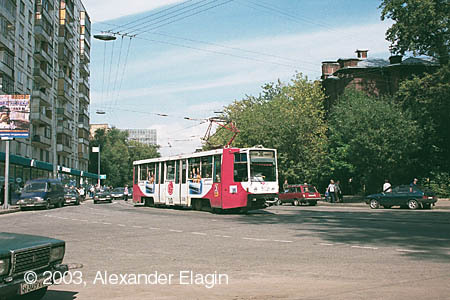 The next part of the same street (to the right) is named Izmailovskiy Val.